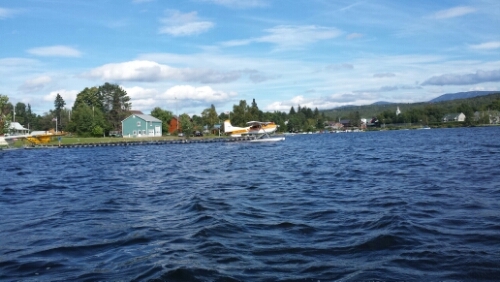 De Plane!De Plane in lake could really get you home quickly! So glad you took an extra day to relax and recoup…particularly in light of the storm forecast. You are both such smart hikers!! I do have to wonder, however, about the canoeing thing when it’s a rest day. Dad and I are thinking we’ll have to stop every hour or so on the drive home to let you walk, hike, run, canoe, etc. so you don’t go too stir crazy! 🙂 Maine needs to know that YOU know what you’re doing and you’ll get to Mt. Katahdin! You are so close now; you must be hearing your names from the Big K. Stay safe and healthy. We are soooo looking forward to seeing you after your Mt. K summit. Sending Big-K-is-calling-you-and just-around-the-corner thoughts, many more prayers and oodles and oodles of love.